Don’t miss out on our FREE marathon preparation evening! Complimentary Marathon Preparation Evening with Complete Physio! 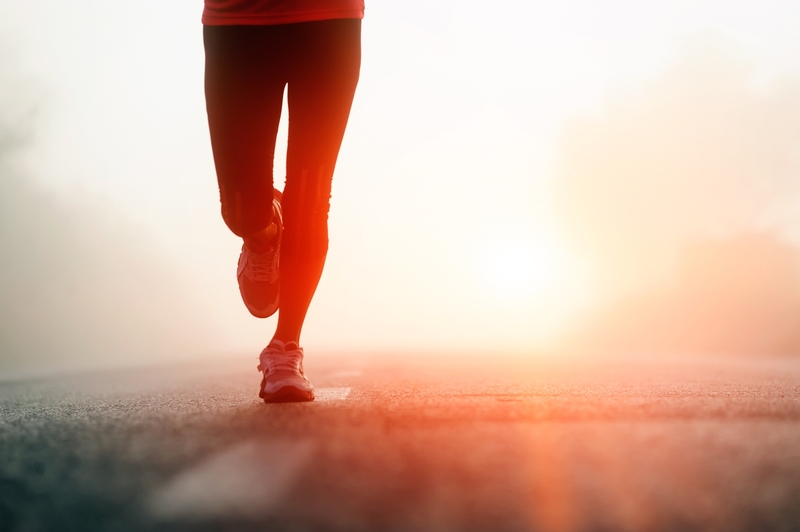 Following the success of the last three years, Complete Physio is hosting its fourth annual Complimentary Marathon Preparation Evening to prepare both your body and mind for the grueling 26.2 miles. Join Sports Physio, Chris Myers and the Complete Physio Team for an evening of marathon preparation. The evening will be packed with insight, experience and education which will aid novice runners through to regular marathon competitors. The event is totally free and will be held on Wednesday 28th January 2015 at 6:30 p.m. on the 30th Floor of the CityPoint building. Please click the EventBrite link to find more information and to RSVP, and we look forward to seeing you on the 28th! Best of luck with your marathon training! Yoga for runners! New class starting Wednesday 7th January 2015 plus breakfast offer! January is the month of fresh starts, new training programmes and setting goals! It is also the month where is dawns on us that we signed up to or a got a place in a big marathon this year! For runners, training re-starts after the Christmas and new year break. I see a lot of very new and very experienced runners coming in to Physio with niggles after getting back on the road or treadmill. Often one of the causes of ankle, knee hip and lower back pain is a lack of flexibility. Run fast (http://www.run-fast.net/) know this and have started a ‘yoga for runners’ class at their store right in the City of london (http://www.run-fast-retail.net/) with Katrina Kurdy (http://katrinakurdy.com/yogainfo/). Classes are well-rounded, with modifications given to make postures more accessible for beginners or more challenging for the experienced. You’ll build strength, increase flexibility and there will always be a light-hearted inversion or hand-balance to keep it challenging and fun. This class is specifically tailored for runners so you can expect lots of core exercises, glutes work, stability and proprioception work. Classes are £15 which includes a free coffee and breakfast! Can’t say fairer than that! Please contact: hannah.walker@run-fast.net to book your place! 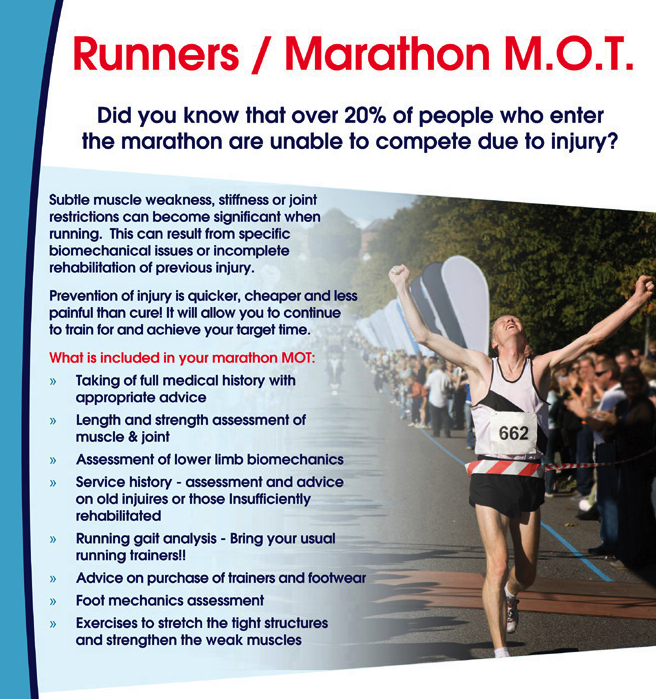 Do you need a MARATHON MOT? January is nearly up and it seems like everyone is up and running… literally! So if you have already entered or considering a distance event this year then prevention is better than cure! FREE PRE-MARATHON EDUCATION EVENT 15TH JANUARY 2014! Complimentary Marathon Preparation Evening with Complete Health and Wellbeing! Following the success of last January’s Pre-Marathon event, Complete Health and Wellbeing are hosting another free information evening to prepare your body and mind for the gruelling 26.2 miles. The event is totally free and will be held on Wednesday 15th January 2015 at 6pm on the 28th Floor of The CityPoint building.